First published nearly 50 years ago, this is ideal monthly reading if you love building model boats. Covering every type of model boat including warships, tugs, lifeboats and historical ships, with a special emphasis placed on scale modelling and radio controlled boats. Each issue features kit and model reviews, show reports, news from the boat modelling world and regular expert columns. 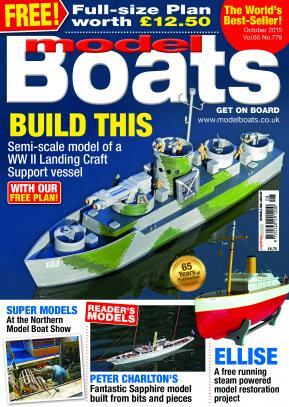 Model Boats magazine publishes 13 great issues a year. This is a fantastic hobby because it combines the personal construction of model yachts, powerboats and scale craft with their radio controlled operation and the opportunity to meet and socialise with fellow minded hobbyists. Skills ability is not important, because the hobby caters for beginners and experts alike and all are welcomed equally. Model Boats covers the whole spectrum of this great hobby, including bi-monthly Free Plans for beginners and experts alike.